Our commitment is exactly as stated in our Mission Statement. Changing The World, One Dirty Diaper At A Time. For a family who is under resourced, this is a lot of money! One side note, the St. Louis Crisis Nursery goes through more than 100,000 diapers every year! St. Louis Crisis Nursery cares for children on a short term basis and this program is called “emergency respite care,” which allows parents a little time to take action on moving their life forward. Many of us don’t understand the nearly impossible challenge of caring for a child or children without a support network or the money to hire someone to help. How do you go look for a job, move away from an unwanted living situation, or even just get a minute to breathe…? Did you also know, the Crisis Nursery has long term planning for families through their “Family Empowerment Program?” This program provides support beyond immediate needs such as budgeting and parenting classes, social events, in home visits and on going guidance and assistance. 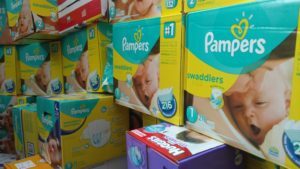 St. Louis Crisis Nursery is, quite frankly, keeping families together and sometimes a package of diapers is their way in. So, when you drop some diapers in the bin at Aldi or hit purchase on Amazon, the ripple effect of your donation goes much, much further than you can possibly imagine. Please visit the Crisis Nursery’s website for more information and for additional ways that you can help! How Much Of My Donation Benefits Children? 100% of every donation in the form of diapers and baby accessories benefits the Crisis Nursery. Any donations in the form of money will be used for various operating costs, such as marketing material or paying for services like this website. As stated in the by-laws of the Pooper Troopers, no part of the cash donations can be used to pay or benefit the trustees or officers of this organization. In other words, the men and women who run the Pooper Troopers don’t get a paycheck for their work, this is a 100% volunteer driven organization. The Pooper Troopers started in December of 2015 as Erwin and Janet Emge’s family debated what charity they should help during the holiday season. As fate would have it, family friend Mary-Beth Mueller came along asking for help with a charity she worked at by the name of Mary Queen of Angels. This very small charity in O’Fallon, MO gathered baby clothes and diapers for the distribution to local families in need. Long story short, they were in dire need of diapers and we needed to figure out a way to help. 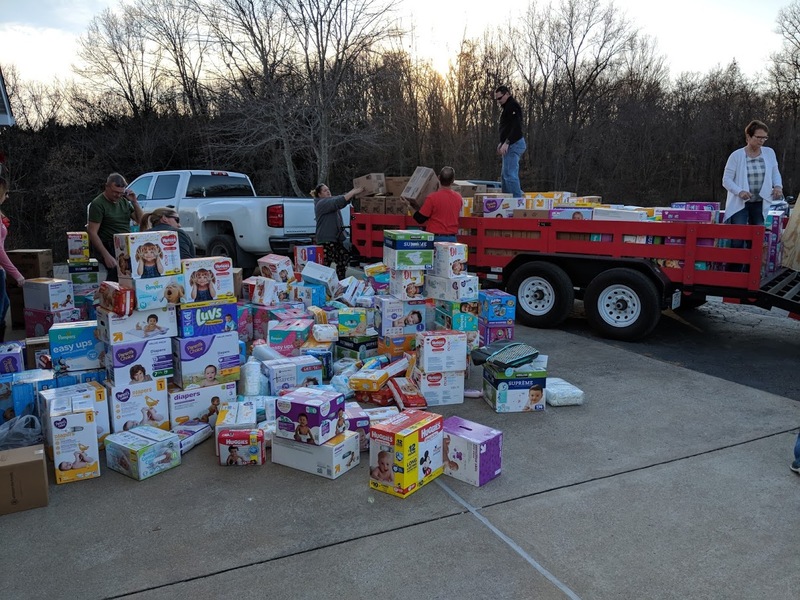 That first year we sent out the word to friends and family over Facebook for donations and to our surprise we gathered a little over 15,000 diapers! We repeated our efforts in December of 2016 which netted a little over 30,000 diapers and baby accessories. Fast forward to December of 2017, only the third year in and we realized that this charity was growing in ways we never could have imagined. We adopted the name “The Pooper Troopers”, we increased our goal to 50,000 diapers, and increased community awareness online. We even got some help from our friends at KMOV-TV who aired a story about the efforts (video can be seen below.) With Mary Queen of Angels being too small for such a large amount of diapers, we changed course and made the Crisis Nursery the primary benefactor of the donation with small portions of the diapers also going to Mary Queen of Angels. In the end, we raised well over 71,000 diapers!!! 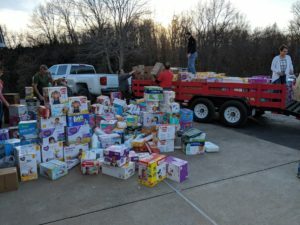 In 2018 the Pooper Troopers teamed up with KMOV-TV and Aldi for a two-week diaper drive with a goal of 150,000 diapers. The St. Louis community stepped up to the task in ways we couldn’t imagine. In the end we were able to raise 264,935 diapers and hundreds of other baby accessories! In early 2018, the Pooper Troopers became a 501(c)3 and is registered in the State of Missouri. In order to comply with the standards set forth by the IRS, we are dedicated to being as transparent as possible with how the organization is run and where your donation goes. This is the list of men and women who are on the Board of Directors. You are welcome to contact the Pooper Troopers for more information.